Although previous studies suggest that postural control requires attention and other cognitive resources, the central mechanisms responsible for this relationship remain unclear. To address this issue, we examined the effects of altered attention on cortical activity and postural responses following mechanical perturbations to upright stance. We hypothesized that cortical activity would be attenuated but not delayed when mechanical perturbations were applied during a concurrent performance of a cognitive task (i.e. when attention was directed away from the perturbation). We also hypothesized that these cortical changes would be accompanied by alterations in the postural response, as evidenced by increases in the magnitude of anteroposterior (AP) centre of pressure (COP) peak displacements and tibialis anterior (TA) muscle activity. Healthy young adults (n = 7) were instructed to continuously track (cognitive task) or not track (control task) a randomly moving visual target using a hand-held joystick. During each of these conditions, unpredictable translations of a moving floor evoked cortical and postural responses. Scalp-recorded cortical activity, COP, and TA electromyographic (EMG) measures were collected. Results revealed a significant decrease in the magnitude of early cortical activity (the N1 response, the first negative peak after perturbation onset) during the tracking task compared to the control condition. More pronounced AP COP peak displacements and EMG magnitudes were also observed for the tracking task and were possibly related to changes in the N1 response. Based on previous notions that the N1 response represents sensory processing of the balance disturbance, we suggest that the attenuation of the N1 response is an important central mechanism that may provide insight into the relationship between attention and postural control. Dual-task experiments, in which subjects simultaneously perform a postural task and a cognitive task, show alterations in the performance of the postural task [1–6], the cognitive task [7–10], or both tasks [11–20]. The results of these studies suggest that, in some way, postural control requires attention or other cognitive resources. However, central mechanisms that might be responsible for alterations in postural control and/or the cognitive task during a dual-task challenge remain unclear. One method to examine the central mechanisms involved in postural control is to measure cortical potentials (perturbation-evoked potentials or PEPs) following mechanical perturbations to stability using scalp-recorded electrodes [21–27]. Early PEPs involve a variable initial positive peak (P1) followed by a stable negative peak (termed "the N1 response"). The N1 response typically peaks within 100 to 200 ms following perturbation onset, and is often followed by later cortical potentials (termed "late PEPs") that peak within 200 to 400 ms with respect to perturbation onset. Previous studies have suggested that early PEPs represent sensory processing of the postural disturbance. For example, Dietz et al. observed attenuated and delayed cortical potentials during perturbed gait compared to perturbed stance, which were similar in direction (although larger in magnitude) to the changes observed in electrically-evoked potentials during gait compared to quiet stance . It was hypothesized that the attenuated cortical potentials during gait were the result of presynaptic inhibition of Ia afferent signals from the lower limbs by ongoing sensory discharge from lower-limb movement. Hence, they suggested that early PEPs represented somatosensory afferent signals following a balance disturbance. Recently, we examined the role of late PEPs as they relate to the balance response . To characterize later potentials following a balance disturbance, PEPs were recorded during a seated task that involved a mechanical perturbation to an inverted pendulum that was balanced by ankle musculature. This seated task permitted manipulation of the presence of a balance response while maintaining similar perturbation conditions. Changes were observed in the magnitude of late PEPs when the balance response was absent. As such, we suggested that late PEPs reflected both sensory and motor processing of the balance response. In addition to characterizing and identifying the source of PEPs, studies have also examined factors that affect PEPs. For instance, previous studies have shown that N1 magnitudes can be influenced by changes in stance width , subject age , stimulus predictability , and perturbation magnitude . Based on the modifiability of N1 responses, Dietz et al. [22, 24] suggested that N1 magnitudes reflected processing of afferent information by supraspinal motor centres. Although no studies, to our knowledge, have been conducted to examine the effect of a cognitive task on PEPs, the effect of altered attention on cortical activity in specific sensory pathways has been extensively studied. When subjects attended to specific sensory modalities, cortical activity associated with the attended modality was increased, and when subjects were distracted, the magnitude of cortical activity of the previously attended modality was reduced [29–34]. Altogether, these results suggest a sensory gating process whereby attended stimuli are enhanced while unattended stimuli are suppressed. We propose that these attentional influences on cortical activity of specific sensory inputs may also be evident in the gain of perturbation-evoked N1 responses. It has also been suggested that the stabilization phase of the postural response requires attention [3, 9, 16–18]. As such, if late PEPs reflect sensory and motor processing of the postural response , we also predict attenuated late PEPs during a concurrent cognitive task. It is possible that such attention-related attenuation in PEPs could result in changes to postural control. The objective of this study was to examine the effect of attention on cortical and postural responses that follow a mechanical perturbation to upright stance. Specifically, we explored the effect of a cognitive task on PEPs (measured at the cortex) and evoked postural reactions (measured using ground reaction forces and lower-leg EMG activity). We hypothesized that the N1 response would be attenuated but not delayed and that the magnitude of late PEPs would be reduced when mechanical perturbations to upright stance were applied during the concurrent performance of a cognitive task. We also hypothesized that effects of the cognitive task on early and late PEPs would be accompanied by changes in the postural response, as characterized by increases in the magnitude of the first and second peaks in the AP COP displacement profile (i.e. the initial stabilizing response and the subsequent correction in the opposite direction). We also expected to see an associated increase in the magnitude of EMG activity from ankle musculature. The changes in the first AP COP peak excursion would concur with findings by Norrie et al. . Seven healthy young adults (4 males and 3 females; age range 21–32 years) participated in this study. Exclusion criteria included any musculoskeletal, neurological, or cardiorespiratory conditions that could influence balance or mobility. All subjects provided informed written consent prior to the experiment. The local ethics review board approved this study. Transient unpredictable horizontal translations of a computer-controlled moving platform were used to evoke "feet-in-place" balance reactions during upright stance. The perturbation waveform was a 300-ms acceleration pulse followed by a 300-ms deceleration pulse (Figure 1a). Maximum acceleration and velocity of the moving platform were 0.5 m/s2 and 0.15 m/s, respectively (as measured by an accelerometer and linear potentiometer mounted on the moving platform). This perturbation magnitude was sufficient to evoke automatic postural reactions measurable from ankle muscles without evoking stepping reactions. Direction and timing of perturbations were randomized in order to prevent anticipatory responses. The platform moved unpredictably either forward or backward, and the duration between perturbations ranged from 8 to 68 seconds. A) Average cortical activity, electromyographic activity, and platform acceleration of one subject during the no-tracking condition (n = 32 trials). Early components of perturbation-evoked potentials (PEPs) from CZ include the N1 response and late PEPs, as denoted by the hatched area within a 300-ms time interval following the N1 response. The gray dashed line indicates the onset of right tibialis anterior activity (RTA) and the black dashed line indicates the onset of perturbation. B) Example trace of a tracking trial from a single subject. Black line represents the subject's tracking performance and the gray line represents the target waveform. Perturbations were applied during two task conditions: 1) performing a concurrent cognitive task and 2) no performance of this task (control condition). The cognitive task was a computerized visuomotor tracking task that was similar to those used in previous experiments [9, 16–18]. This task involved tracking an unpredictable moving target with a cursor that was controlled by a hand-held joystick that was manipulated with the thumb. The pseudorandom target waveform (Figure 1b) consisted of an algebraic sum of three sinusoids (0.24, 0.28, and 0.42 Hz) and was displayed on a computer monitor situated 1 m in front of the subject. Prior to the perturbation, subjects were instructed to stand in the middle of the platform using a standardized comfortable foot placement  and to do whatever came naturally to keep their balance. During tracking trials, subjects were also told to track as accurately as possible. In order to encourage subjects to accurately and continuously track the moving target, an error estimate was displayed to the subject after each tracking trial and tracking performance was monitored by the experimenter. To prevent any extraneous movements of the tracking hand, the wrist was supported in an arm sling that was tightly secured to the body. During non-tracking trials, subjects held the joystick while looking straight ahead at a blank screen. The focus of the study was on backward-sway responses evoked by forward platform translations. Backward translations were also included but solely for purposes of deterring anticipatory responses. For each task condition, subjects were presented with 33 forward-translation trials and 27 backward-translation trials. Due to technical problems during forward-translation trials, only 27/33 non-tracking trials and 25/33 tracking trials were collected in one subject. In a second subject, only 24/33 tracking trials were collected, and in a third subject, only 30/33 non-tracking trials were collected. Two practice trials were provided for each task condition and data from initial trials were excluded from the analyses in order to minimize any arousal or learning effects. In addition, task conditions were varied randomly between trials and rest breaks were provided every 30 minutes in order to minimize any order effect or fatigue. A gold-cup scalp electrode was used to record cortical activity at the vertex (CZ of the International 10–20 system); CZ was referenced to linked mastoids. CZ was chosen based on previous studies that showed maximal cortical responses at CZ in response to mechanical balance perturbations [25–27]. Impedances were below 10 kohms for CZ and cortical potentials were amplified (×50,000), filtered (bandpass of 1–10,000 Hz), and sampled at a rate of 500 Hz (Model No. RP7107D, Grass Instruments Inc., USA). Cortical data were visually inspected to be free of artifact prior to data analysis and were ensemble-averaged within each task condition, for each subject, so as to enhance the signal-to-noise ratio. A customized computer program marked the perturbation onset for each task condition and dependent measures of PEPs were systematically determined by visual inspection of averaged data. Based on averaged data, the N1 peak (Figure 1a) was characterized in terms of its onset latency (relative to perturbation onset, i.e. platform acceleration >0.1 m/s2) and magnitude (measured with respect to pre-perturbation baseline activity). In most subjects, the first positive peak deflection (P1) was not distinguishable from background cortical activity; hence, task differences in P1 responses were not analyzed. For analysis of late PEPs (Figure 1a), we calculated task-related differences over a 300-ms time interval by subtracting the magnitude of cortical activity during the control condition from the magnitude of cortical activity during the cognitive task. This approach of subtracting cortical activity between tasks ensured that differences were independent of baseline activity. These task differences were then expressed as the area under the curve over an interval between 200 to 500 ms with respect to perturbation onset. An area of the curve was calculated since the identification of specific peaks could not be reliably identified. This 300-ms time interval was also selected since it was well within the duration of the postural response. AP COP excursions were recorded using two force plates (AMTI and Kistler) that were situated underneath the subject's feet. The AMTI force plate measured forces exerted by the left foot and the Kistler force plate measured forces exerted by the right foot. Force-plate data were low-pass filtered (cut-off at 10 Hz) and sampled at a rate of 500 Hz. Prior to calculating COP peak displacements and initial velocities, specific time points (start of first COP peak excursion, time to the first COP peak displacement, and time to the second COP peak displacement) were systematically selected by visual inspection of COP data. For each trial, the magnitudes of the first (backward) and second (forward) COP peak displacements were determined relative to the mean COP location recorded over a 500-ms interval prior to perturbation onset. In addition, the velocity of the first COP peak displacement was determined by calculating the velocity between the start of the COP excursion and the first COP peak. Since backward-sway (forward platform translation) trials were the focus of the analysis, TA muscle responses were used to characterize the postural response. Surface EMG activity from TA was measured using Ag/AgCl electrodes that were placed 2 cm apart and aligned longitudinally, in parallel with the muscle fibers of TA muscle bellies. The ground electrode was placed on the tibial shaft (impedances were <10 kohms). EMG data were amplified (×500), filtered (bandpass 1–10,000 Hz), and sampled at a rate of 500 Hz (Model No. RP7107D, Grass Instruments Inc., USA). EMG data were further processed using a digital filter (second-order Butterworth) with a bandpass width of 10 to 150 Hz (Labview v5.0, National Instruments, USA). Onset latencies of postural reactions were determined for each trial as the time when full-wave rectified TA EMG activity exceeded a level equivalent to three standard deviations above pre-perturbation EMG activity (Figure 1a). All timing measures were defined relative to the onset of platform acceleration. 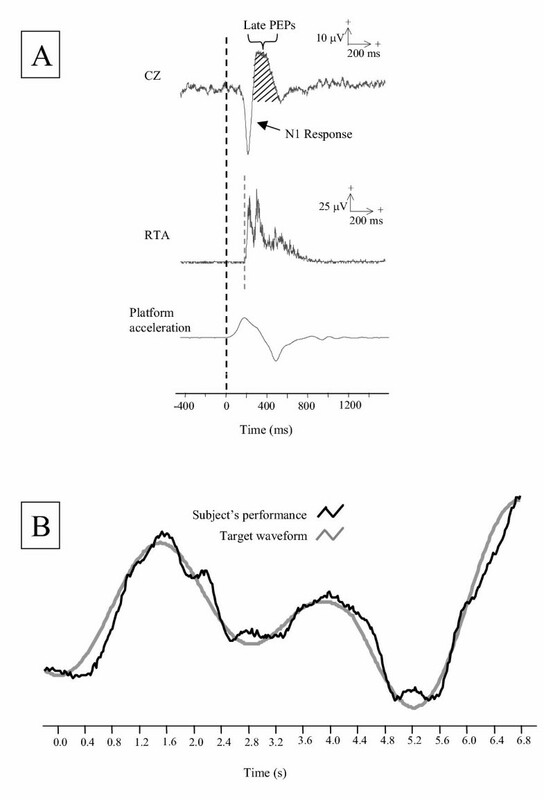 Initial magnitudes of TA activity were also obtained for each trial by calculating the area of rectified EMG activity within 50-ms time intervals (all of which were defined with respect to muscle-activity onset): first 50 ms, 50–100 ms, and 100–150 ms.
To statistically evaluate the effect of task on cortical, EMG, and COP data, paired t-tests were conducted. The alpha level was set at 0.05. For all subjects, forward-translation trials evoked large negative peaks (N1) at CZ (Figures 1a and 2a). The N1 response was similar in latency but differed in magnitude between tracking and control tasks (Figure 2). Average N1 response latencies (±standard error, se) were comparable between tasks (control: 162.9 ms (se 1.7); tracking: 161.7 ms (se 2.5); t(6) = 0.5, p = 0.6; Figure 2b). In contrast, the average N1 response magnitude was significantly reduced during the tracking task in comparison to the control task (control: 27.1 μV (se 5.0); tracking: 18.3 μV (se 4.4); t(6) = 4.8, p = 0.003; Figure 2c). Interestingly, the task difference between average magnitudes of late PEPs was not statistically significant (t(6) = 1.9, p = 0.1). A) Grand average cortical activity (CZ) during tracking (black line) and no-tracking (gray line) conditions (n = 7 subjects). The black dashed line indicates the onset of perturbation. B) Average N1 latencies and standard errors for tracking (black bar) and no-tracking (gray bar) conditions. C) N1 magnitudes shown for individual subjects and average N1 magnitudes (AVG) for all subjects. Data from tracking (black bar) and no-tracking (gray bar) conditions are shown. Average N1 magnitudes were statistically different between tasks (* p < 0.05). Task differences were also observed in average AP COP data. The first (backward) average COP peak displacement was larger during tracking when compared to the control condition, but was not statistically significant (control: 5.4 cm (se 0.5); tracking: 5.9 cm (se 0.5); t(6) = 1.4, p = 0.2). The second (forward) average COP peak displacement was also larger during tracking when compared to the control condition, but was statistically significant (control: 6.3 cm (se 0.8); tracking: 7.1 cm (se 0.7); t(6) = 3.3, p = 0.02). In addition, average velocities of the first COP peak excursion were statistically different between tasks (control: 16.6 cm/s (se 0.8); tracking: 20.4 cm/s (se 1.0); t(6) = 5.8, p = 0.003). To illustrate COP differences between tasks, Figure 3 displays all trials of each task from a single subject. Anteroposterior (AP) centre of pressure (COP) displacements of all trials in one subject during tracking (black lines) and no-tracking (gray lines) conditions. The platform acceleration of a typical trial is also shown. AP COP peak displacements involving the first (backward) peak and second (forward) peak were increased during tracking when compared to the control condition; average magnitudes of the second peak displacement were statistically different between tasks (p < 0.05). Interestingly, in all subjects, the largest initial AP COP peak displacements (Figure 3) were observed during the first tracking trial and the first control trial. Among these trials, task-related differences were apparent in 6 of the 7 subjects. For example, in one subject, the first tracking trial produced an initial COP peak displacement of 12.9 cm, which was greater than the first control trial with an initial COP peak displacement of 10.8 cm. Across all subjects, the average task difference in the first COP peak displacement, for the first trial, was 1.4 cm (se 0.6). Average TA onset latencies were not statistically different between tracking and control tasks; task differences were 5 to 7 ms (left TA: t(6) = 1.7, p = 0.2; right TA: t(6) = 1.9, p = 0.1; Figures 4a and 4b). 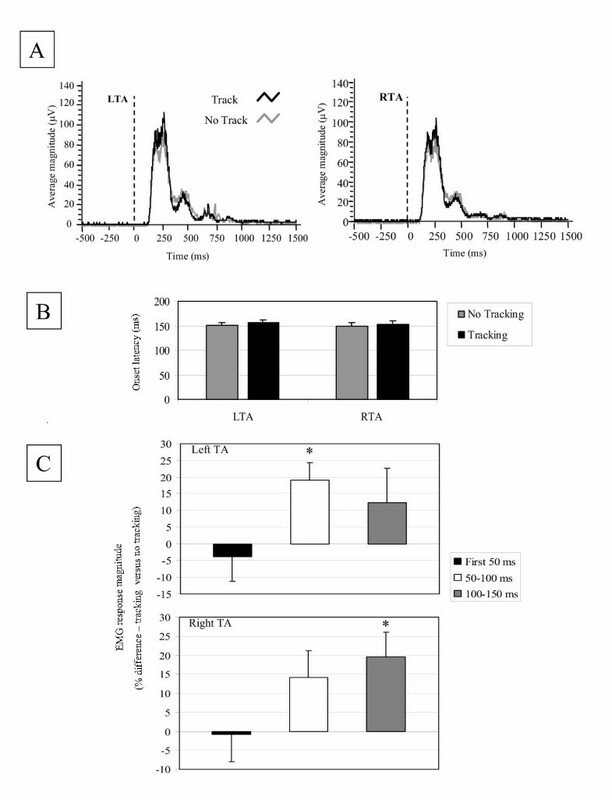 In contrast, increases in average magnitudes of muscle activity during the tracking task were evident for left and right TA activity (Figure 4a and 4c). However, only left TA response magnitudes between 50 and 100 ms and right TA response magnitudes between 100 and 150 ms were statistically different between tasks. The average percent increase in TA response magnitudes during tracking compared to the no-tracking condition was 19.0% (se 5.3) (t(6) = 3.5, p = 0.01) for left TA (50–100 ms) and 19.6% (se 6.3) (t(6) = 3.1, p = 0.02) for right TA (100–150) (Figure 4c). A) Average tibialis anterior (TA) electromyographic (EMG) activity from left (LTA) and right (RTA) legs during tracking (black line) and no-tracking (gray line) conditions (n = 7 subjects). The vertical dashed line indicates the onset of perturbation. B) Average onset latencies and standard errors of left and right TA EMG activity. C) Average magnitudes and standard errors for left and right TA EMG activity. Integrated EMG activity is computed for three time windows (initial 50 ms, 50–100 ms, and 100–150 ms). Magnitude is expressed as a percentage difference between tracking and no-tracking conditions (positive values indicate greater relative activity in the tracking condition). * denotes statistically significant differences between tasks (p < 0.05). This study is the first to examine how a cognitive task affects cortical activity following a postural perturbation to upright stance. We hypothesized that the magnitude of the N1 response and the late PEPs would be reduced during a cognitive task, and that the peak latency of N1 would be unaffected by this task. We also hypothesized that there would be task-related increases in the magnitude of the first and second AP COP peak displacements and EMG activity associated with the postural response. Prediction of an increase in the magnitude of the first COP peak displacement was based on findings by Norrie et al. . The present study supported most of our hypotheses. As predicted, magnitudes of the N1 response were statistically reduced but not delayed during the tracking task, which was accompanied by larger AP COP peak excursions and EMG activity associated with the postural response. However, in contrast to these findings, there was no statistically significant reduction in the magnitudes of late PEPs during the cognitive task. As predicted, the magnitude of N1 decreased during the tracking task, which illustrates the potential effect of a cognitive task on early cortical activity. Although there are no studies that have explored the effects of a cognitive task on PEPs, previous studies have examined attentional influences on cortical activity arising from specific sensory pathways [29–34]. These studies showed that when human subjects attended to a specific sensory modality, cortical activity representing that modality was enhanced, and that when attention was diverted away from a specific modality, representative cortical activity was reduced. Based on reduced magnitudes of the N1 response, which is postulated to reflect sensory processing of the perturbation, we propose that the concurrent tracking task diverted attention (or other cognitive resources) away from the processing of sensory information related to postural instability. It is unlikely that the differences arose due to task-related differences in perturbation. The perturbation magnitudes were consistent between tasks as reflected by similar platform accelerations and initial responses to the perturbation (e.g. EMG responses). One might also suggest that the differences in visual inputs (tracking versus no tracking) may have influenced N1 magnitudes. However, this is unlikely to be the case since previous work has shown no effects of visual input on N1 magnitudes . There are a number of possible reasons why the concurrent tracking task resulted in a reduced N1 response. For example, the tracking task had a high attentional load since this task affected AP COP excursions and EMG activity. Based on the notion that the total attentional capacity is limited , we presume that attentional resources available for each task (i.e. the tracking task and the task of processing sensory inputs related to instability) were reduced when tasks were performed concurrently as opposed to separately. Analogous to previous studies that examined the effect of distraction on cortical responses to modality-specific sensory stimuli [29–34], this reduction in attentional resources available for processing perturbation-related sensory inputs would manifest as a reduced N1 response. Although the specific mechanisms for this altered N1 magnitude are uncertain, a possible mechanism might involve centrifugal gating of sensory inputs by central descending pathways (for a review of centrifugal gating, refer to Canedo ). While the present results were taken from only one cortical site, future studies will involve multiple recording sites and the combination of sophisticated electrophysiological and imaging techniques in order to localize the effects of a cognitive task on PEPs. Although it is unclear why late PEPs were unaffected by the cognitive task, a few possible explanations exist. First, late PEPs might represent cortical activity related to certain cognitive processes. For example, late PEPs might be related to the 'orienting response', which is an auditory-evoked potential that peaks at about 300 ms after the onset of an attention-catching acoustic change [38, 39]. This peak presumably reflects processing of auditory inputs, but is suggested to require no attentional resources . Although our experiment involved distinctly different stimuli (i.e. somatosensory, visual, and vestibular sensation associated with the balance disturbance as opposed to an acoustic stimulus), late PEPs evoked by the postural perturbation might represent a similar type of orienting response. If late PEPs are a type of orienting response that does not require attentional resources, this could explain why the magnitudes of late PEPs were not affected by the tracking task. Alternatively, the recording of one electrode site (CZ) might be inadequate for capturing effects of altered attention on late PEPs. Frontal and parietal regions have been associated with task switching and attention sharing . Hence, future studies will involve multiple electrode-recording sites that include frontal and parietal areas of the cortex. Ultimately, further research is needed in order to understand the function of late PEPs and the attentional influences on these cortical events. Although a reduction in N1 magnitudes suggests a disruption of sensory processing related to the postural perturbation, specific mechanisms that relate to the interaction between the cognitive task, late PEPs, and the motor output of the balance response are uncertain. As such, future studies are warranted to determine specific attentional mechanisms related to motor processes of postural control. Decreases in the N1 response during the tracking task were accompanied by increases in AP COP peak excursions and associated increases in TA EMG activity, which supports our hypothesis that altered cortical activity would be associated with alterations in postural control. Although not statistically significant, the trend towards an increase in the magnitude of the first (backward) COP peak excursion during tracking was similar to findings by Norrie et al. . This trend was accompanied by a statistically significant increase in the magnitude of the second (forward) COP peak excursion. Interestingly, velocities related to the first AP COP peak excursion were faster during tracking than the control condition. Altogether, AP COP data suggest a tendency of the central nervous system to react more vigorously when attention is diverted away from postural control. While it is possible that an overactive response represents an adaptation that acts to safeguard stability, it is also possible that an overactive response reflects an inefficient postural reaction. This is supported by the observation that the second COP peak, which is thought to reflect a correction for the "overshoot" in the initial response, was also increased during the tracking task. 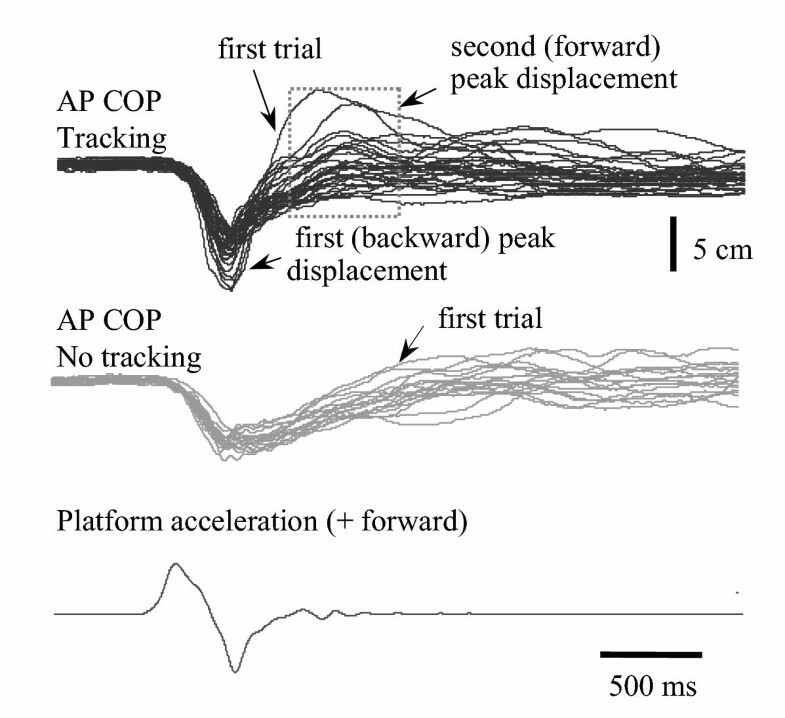 As mentioned previously, the largest AP COP peak displacements were observed during the first tracking and control trials, demonstrating the effects of initial perturbation exposure on postural responses. Other studies have also demonstrated differences between initial trials and later trials [42, 43]. It is possible that increased arousal, during the initial trials, led to an overactive response . It is also possible that over the course of repeated trials, subjects were able to learn to respond to the perturbations more efficiently as they became more familiar with the features of the perturbations. In view of these trial-to-trial variations, it would be of interest in future studies to develop alternate approaches to permit single-trial analysis of evoked-potential data. Whereas our data indicated an increase in early TA activity during the cognitive task, Rankin et al. observed decreases instead of increases in the magnitude of TA activity when subjects were engaged in a dual-task condition (performance of a mental arithmetic task while maintaining their balance). Rankin et al. suggested that deficient ankle muscle responses were associated with a change towards a stepping strategy during their dual-task condition. However, due to the small perturbation magnitude that was used in our study, the stepping strategy was not the preferred postural response. Instead, subjects were reliant on "feet-in-place" ankle muscle responses, which could account for the observed increases in TA activation in our study. Other possible explanations for the discrepancy between our results and theirs could relate to differences in perturbation characteristics, the central set, the attentional demands of the balance task and the cognitive task, and arousal levels. Clearly, in order to explain this discrepancy in TA activity, more work needs to be done to understand the interaction between these factors and changes in muscle activity during a cognitive task. Although a significant reduction in TA magnitudes (50–100 ms with respect to left TA onset and 100–150 ms with respect to right TA onset) during the cognitive task could suggest changes in the initiation of TA responses, there was no difference in the initial latency or magnitude (initial 50 ms) of the evoked TA response. Based on previous studies [3, 9, 16–18] and our recent findings, it is likely that attention-related changes in TA activity happen during the stabilization period of the postural response and not during the initiation of TA activity. The current study was not designed to explore transient changes in the visuomotor tracking task associated with the postural reaction since perturbation onset was not timed to occur at specific points in the tracking task (as was performed by Norrie et al. ). As a result, it is not possible to quantify the specific influence of the postural reaction on the concurrent tracking task. 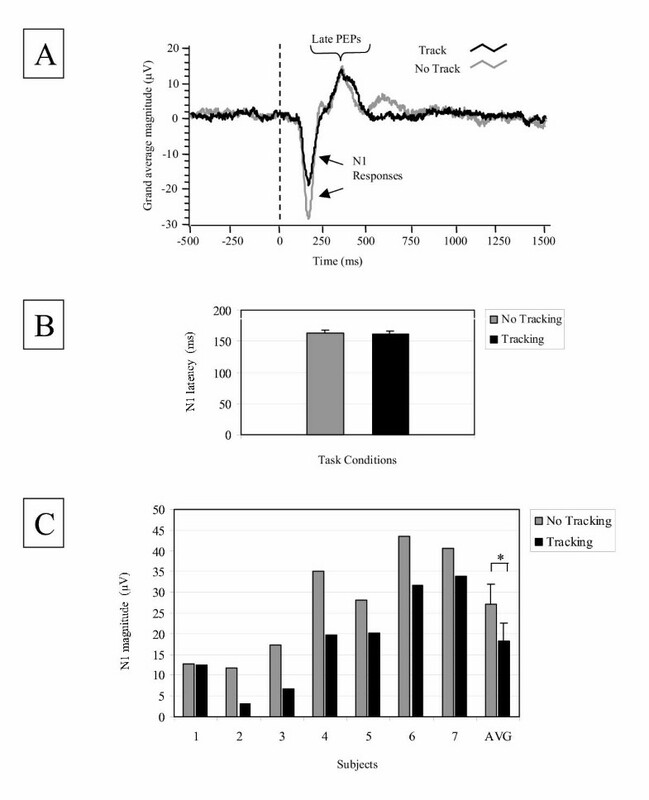 While subjects demonstrated consistent visuomotor tracking performance over the entire trial, it is predicted that the influence of the concurrent postural reaction would be expressed as a transient change in tracking performance, which would correspond with brief shifts in attentional resources [9, 16–18]. Complementary support for the significance of such attentional requirements associated with postural control arises from a number of studies [1–20]. The visuomotor tracking task was chosen as the cognitive task for several reasons. First, the sensorimotor elements of the task (visual inputs and sensorimotor control of the hand) did not appear to influence the evoked cortical potential, which limits confounding associated with sensori-sensory conditioning. There was no influence on PEPs due to visual inputs  or from repetitive flexion and extension movements of the hands or fingers (pilot data). In contrast, sensori-sensory conditioning of PEPs would have been a potential concern for tasks that influence somatosensory inputs from the lower limbs since N1 magnitude was attenuated by vibration of the quadriceps tendon . As a result, in this study, the associated attenuation in N1 during visuomotor tracking is proposed to arise from the 'cognitive' demands of tracking, specifically the attentional requirements of this task. Other advantages of selecting visuomotor tracking as the cognitive task are that it has been shown to affect postural reactions during a dual-task paradigm [16–18] and that it requires ongoing vigilance since it is continuous (Figure 1b). Use of a continuous task as opposed to a discrete task is important when evaluating the influence of the cognitive task on transient responses to perturbation, which are possibly related to rapid attention switching [9, 16–18]. Future studies will examine the effects of other cognitive tasks that require different cognitive processes and attentional loads on PEPs. This study is the first to explore attentional influences on postural control at the level of the cortex. The reduction in the magnitude of N1 clearly demonstrates an effect of altered attention on early cortical activity following a balance perturbation. Since it has been suggested that the N1 response represents cortical activity related to postural instability, the attenuation in the N1 response suggests an attentional requirement for processing sensory information related to the postural disturbance. Furthermore, these data suggest possible associations between reduced N1 magnitudes and changes in postural activity. Currently, little is known about the loci involved in the attentional modulation of the N1 response, the cortical activity that relates to cortical processes and postural responses, and the interaction between the N1 response and late PEPs. As such, future research will address these concerns. Furthermore, in order to determine the functional consequence of these findings to clinical populations who are at risk of falls, future studies will be conducted to explore the effects of a cognitive task on cortical activity and postural responses in individuals with cognitive and balance impairments. This study was supported by the Physiotherapy Foundation of Canada (SQ), the Canadian Institutes of Health Research (SQ, BEM, WEM), and by the Natural Sciences and Engineering Research Council of Canada (WEM). We would also like to acknowledge the contributions by K. Ellis, M. Barnes, P. Mieschke, and R. Wali for their assistance with data collection and analyses. SQ initially designed the study, coordinated and executed all aspects including data collection, analyses and drafting the manuscript. ALA participated in the design of the study and assisted with data collection. BEM and WRS participated in the design of the study and editing of the manuscript. WEM oversaw the project, participated in the design of the study and edited the manuscript. All authors read and approved the final manuscript.